In keeping with my tradition of buying new albums six months after their release, I picked this David Murray album up today, along with last year's Clap Your Hands Say Yeah album. Of all the band with high-pitched, somewhat whiney singers - Arcade Fire, Shins - I think CYHS ranks pretty high. Well at least I liked their sophomore effort more than the Arcade Fire's album last year, which were pretty strong but not exactly Woh my god, this is amazing (the Shins do that to me sometimes). CYHS's Some Loud Thunder reminds me of Neutral Milk Hotel and Olivia Tremor Control at times, which in my book really takes the cake. They were playing bad nu country at work yesterday. Things really reached the bottom of the moonshine bucket when they played a twang version of the reggae classic "The Harder They Come." Whose stupid idea was that? Yeah, they thought, it fits the sentiment of a country singer's style, so just strip away what makes it unique and give it backbeat that appeals to people who drink too much. Wham. I can see the numbers adding up. I was also inspired to come up with a country parody for the next time my friend John and I have a session with our made up band the Wayback Machine: "I Like Music When I Don't Have To think." None of the songs I heard have one iota of creativity behind them, a buttload of annoying melodies and they probably won't be remembered 9 months from now. Re: that song title: it'll probably require some tweaking to get the thought to be concise. But you get the idea, right? I haven't heard the song "Me and You and a Dog Named Boo" in at least 30 years. (I had it on a record of '70s hits by some no-name cover band, which was a birthday present at age 7.) I've heard the original version - by soft rocker Lobo - about three times in the past month. Thanks WJAS. You're going down the drain. Yesterday, I finally remembered to check youtube to see if there was a posting of the classic '70s commercial for Kawasaki with the "Let the Good Times Roll" jingle in it. I can't get that song out of my head. 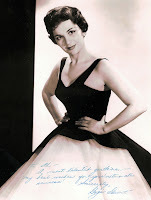 It was written by Bob Thompson, a guy who one of the cheesier of the cheesy lounge music bandleaders in the '50s. He did have one classic album cover, though, with a broad reclining in a giant martini glass. I spent about 10 minutes trying to find out his name before writing this posting, which took about 2 minutes. Hope you're impressed. Hope you let the good times roll. This past Sunday, my son Donovan went to his first live music performance. It was a unique one to be sure, at a unique venue. 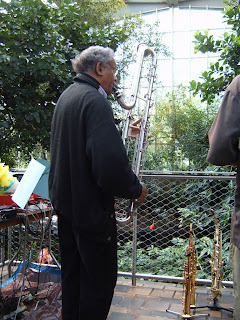 He and I went to the National Aviary to see Anthony Braxton perform with a local group called the Syrinx Ensemble. And the birds were part of the performance too, as their songs and squacks and sounds shaped the music. It's crazy being at a gig/show where everyone sound becomes part of said performance and shapes the direction of it. That's a rather John Cage way of thinking of it, but nobody probably thinks about shows that way anymore. I was worried that things might get too shrill for Donovan's 13-month old ears, but Ben Opie (who was a catalyst in the slew of Braxton Plays Pittsburgh Plays Braxton events for the weekend) assured me otherwise. He was right. About 30 minutes in, Ben and Braxton were building up a low drone on their contrabass clarinets. As the sound started bubbling I looked at Baby D to see what he thought. I don't think that's a bad thing at all. From someone who falls asleep to music each night, that's probably a compliment.